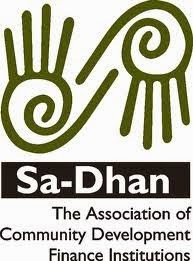 Sa-Dhan hosted the 9th National Financial Inclusion Conference in Mumbai on March 14, last week. The conference was titled "Partnership and Future Growth: Challenges Ahead for the Microfinance Sector". IFMR Research served as a Knowledge Partner at the event and we plan to publish blogs on all seven sessions of the conference, starting today with the plenary session. Bakground: The Agenda of the Sa-Dhan Conference went beyond the issues and challenges of the Microfinance sector and addressed panoramic concerns pertaining to the political economy of the Country. The discourse was situated on a wider landscape to address issues related to endemic poverty and effect of globalization on the rural livelihood practices. The Conference deliberated on dilemmas relating to technology and its enabling and disabling impact on Microfinance; on government programs and its effect on poverty alleviation. The forum discussed regional expansion of Microfinance and its focus on undeserved areas, legislative policies and its impact on the poor. The Conference was aimed to build partnerships between Regulators, Investors and Bankers on the one hand; and Clients, Microfinance Institutions and Academicians on the other hand. The Conference also focused on the much awaited Reserve Bank of India’s Self Regulation for Microfinance sector and Micro Finance Bill 2012.